Thank you so much to Diana for sending this postacrd to Geography Cat from the glowworm caves at Waitomo, located in the North Island of New Zealand, Aotearoa. Aotearoa is the Māori name for New Zealand, which translates to English as the “land of the long white cloud”. The caves have formed over millions of years in the limestone (karst) rock, and include stalagmites and stalactites, waterfalls and vast caverns. 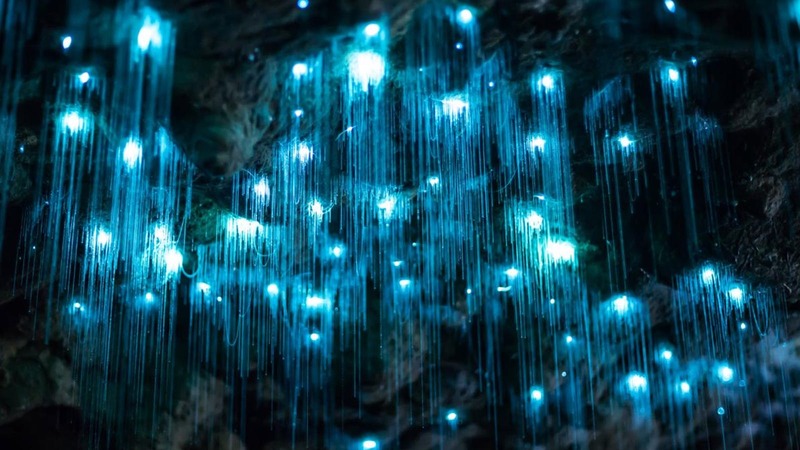 The glowworms are actually larvae of the fungus gnat. Each larva hangs up to 70 silk threads from the ceilings of the caves and hangs there emitting a bluey green light. The light attracts the prey; small insects, who then get stuck in the silken threads, just like a fly being caught in a spider’s web. The enormous scale of the caves and the phenomenal number of glowworms present can be seen in the picture postcard above. The caves at Waitomo are carefully managed, thanks to the guidance of a scientific advisory group who continually monitor conditions within the cave system. Visitor numbers have to be regulated to avoid a potentially hazardous build up of carbon dioxide.